Dasbari Mosque is located close to Ompur in between Sona mosque and Kotowali Dorja. 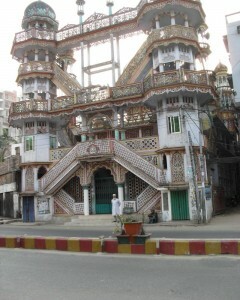 Generations of local people say it as Dasbari. It is an abandoned place now. 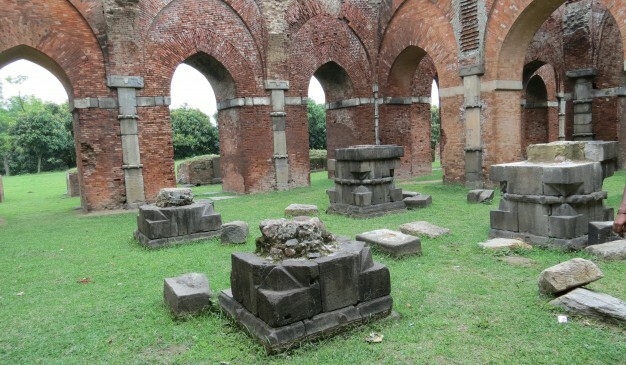 According to an inscription in 1497 during the reign of Sultan Shamsuddin Yousuf this mosque was built. No explanations are found regarding how this mosque was named. It is modeled after the Chamchika mosque in India. 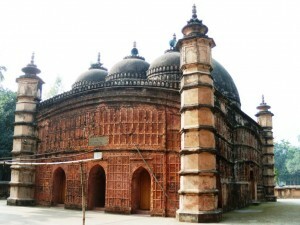 Like Dasbari this mosque is built with terracotta bricks. Its circumference is so thick that during the month of Chaitra when it is so hot outside but it remains cool inside. The main dome here looks pretty attractive. North to the mosque there is a Dighi whose volume is 60 bigha. 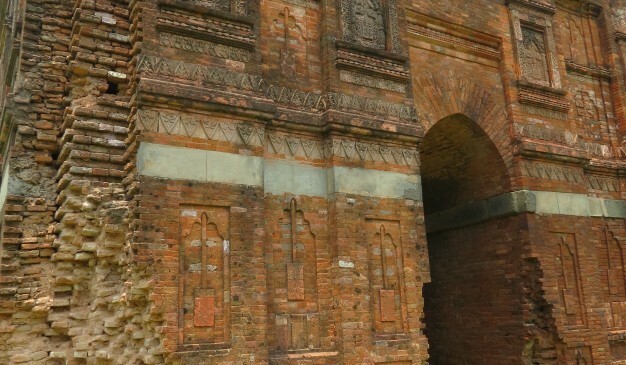 Thi spot is located in Chapai Nawabganj Sadar Upazilla. 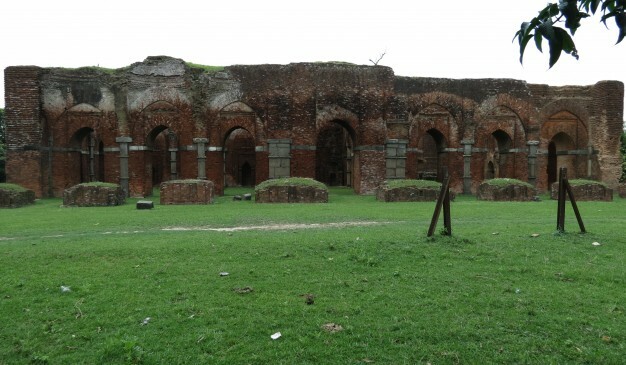 After reaching Chapai Nawabganj you may head there by bus or CNG auto rickshaw. All the buses start from Dhaka to Rajshahi, go to Chapai Nawabganj. For example, Hanif Enterprise, Modern Enterprise, Shyamoli Paribhaban etc. The major transportation system in this town is the bus service to different districts and towns. The main transportation route is Nawabganj-Rajshahi. The bus transportation service is off three types which are gate-lock, direct and local service. The others bus routes are Nawabganj-Shibganj, Nawabganj-Naogaon, Nawabganj-Nachol, Nawabganj-Rohanpur. The BRTC bus service serves for the long intra-district route to almost all important districts of Bangladesh. The most important long route is the Nawabganj-Dhaka. This route has ample bus service. There are two bus stoppages. The biggest one is called Chapai Nawabganj Bus Terminal and the other is the Dhaka Bus Terminal. Sona Mosjid-Rajshahi-Sona Mosjid bus Service are on at 7.15am to 5.15pm every 1 hour after. In the past, the main transport system was based on the water path. The river Padma (Ganges), Mahananda River, Pagla, Moraganga and some beels (marshland) were used for intra-district transport system. The water level went down due to adverse effect of Farakka Barrage on Padma (Ganges) river, and therefore, water transport has lost its popularity. But still rivers are used for transportation of daily goods from different parts of the district. Still the transportation from the villages in western and eastern parts of the district depends on the boat. In the Shibgonj Upazila have a small river name [pagla]. There are limited railway services with Rohanpur and Rajshahi. One of the international rail line passes through the district to Malda, West Bengal, India. There are few services of local train from different stations of Chapai Nawabganj such as Nawabganj Sadar, Amnura, Nachole, Nijampur, Rahanpur to Rajshahi and other parts of Bangladesh and also has a shuttle service from Nawabganj to Rajshahi for the intercity train service from Rajshahi to other part of Bangladesh. 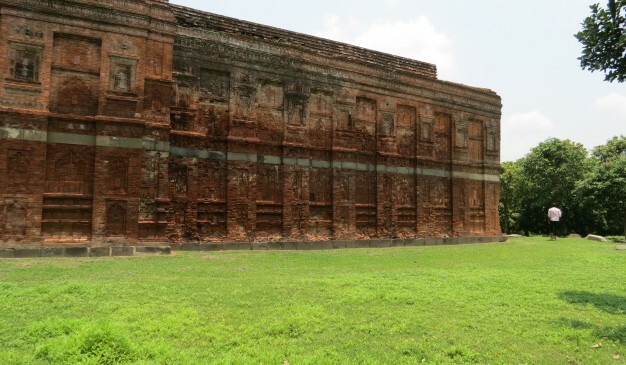 There are many hotels to stay, such as Government Rest House (Rohanpur Upazila), Johrul Cottage (Shahabazpur Upazila), Hotel Al-Hera, Hotel Al-Nahid etc. in the city area. Address: Station Road (Mohananda bus stand), Lakherajpara, Chapai Nawabganj Sadar. 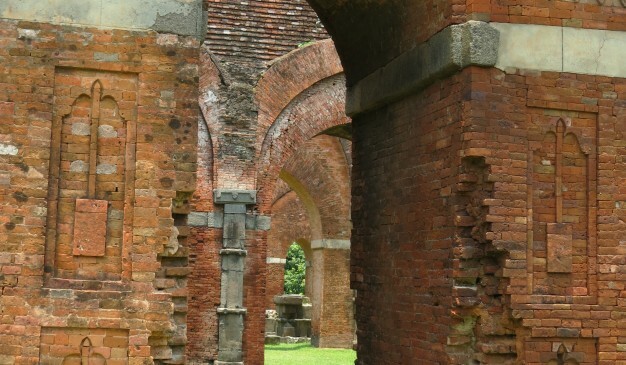 View the ancient architecture of the mosque. 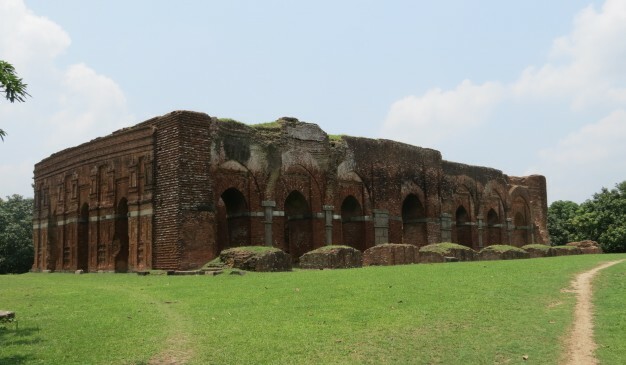 Nayabad Mosque is located in the bank of the river Dhepa, just 1.5 km south-west of the infamous Kantaji Temple at Dinajpur in Bangladesh. The mosque is named after the village “Nayabad” in which it stands in the Police Station of Kaharole. 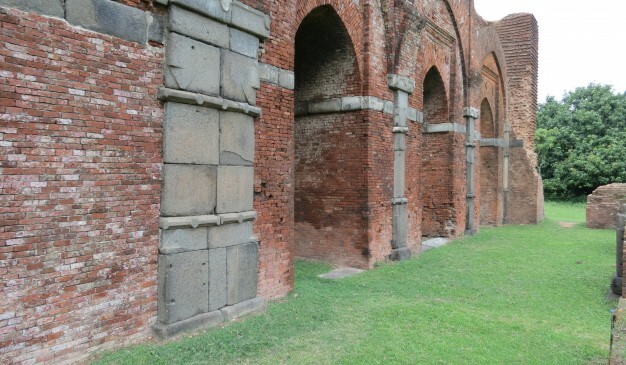 According to an inscription found on the central doorway, it was constructed at 1793 AD in the reign of Mughal Emperor Shah Alam II. 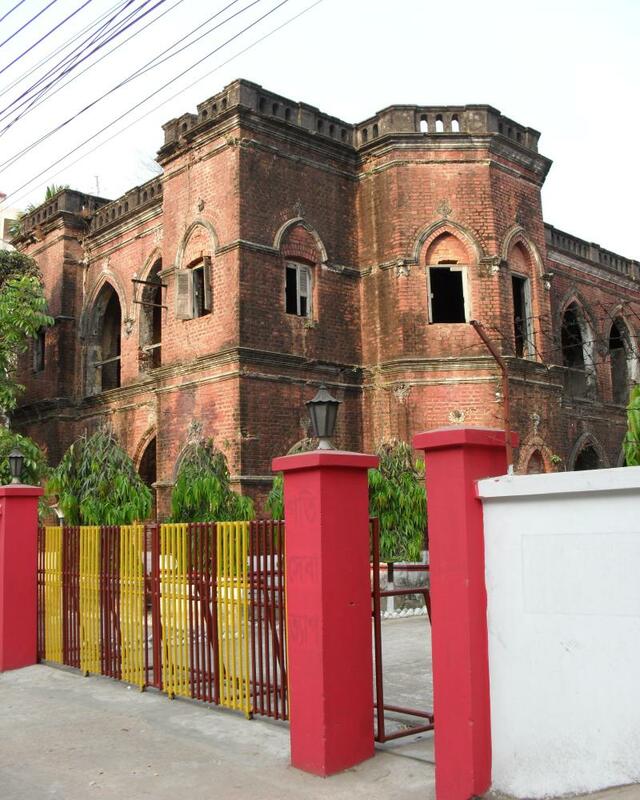 During that period, Raja Baidyanath, the last of the Dinajpur Royal family, was the Zaminder (feudal land owner). 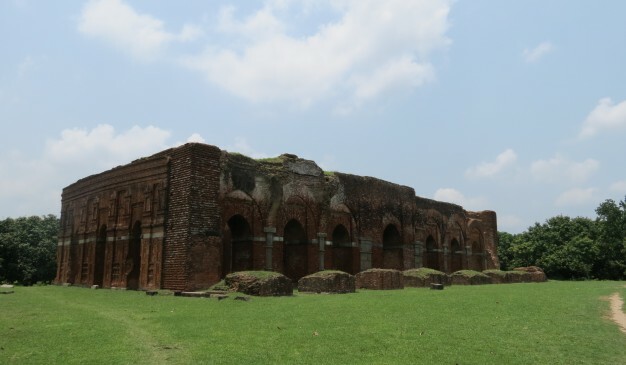 Nayabad Mosque was erected at a time when the soil of Dinajpur had already been enriched with one of the most remarkable Navaratna temples, the Kantajew Temple in 1752 AD. 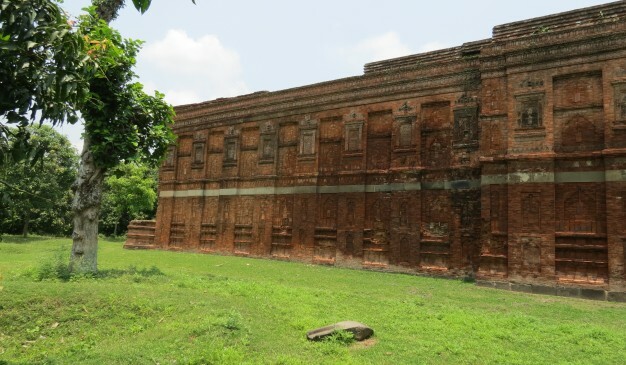 The founding Royal family of Dinajpur was still prominent. 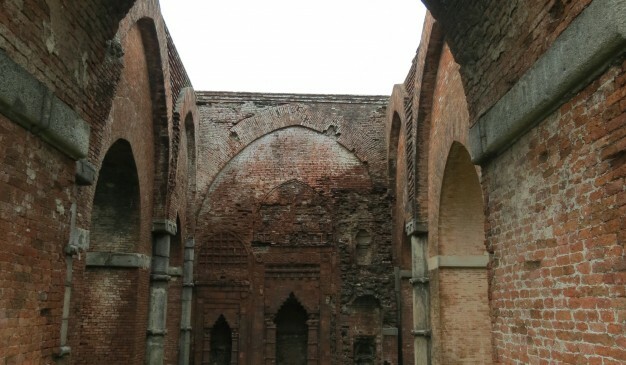 According to local traditions, the mosque was built by Muslim architectural workers who had come to this place from the west to build Kantaji Temple. They had settled in Nayabad, a village near the temple, and had built the mosque for their own use. There is a grave of an unknown person in the premises of the mosque. 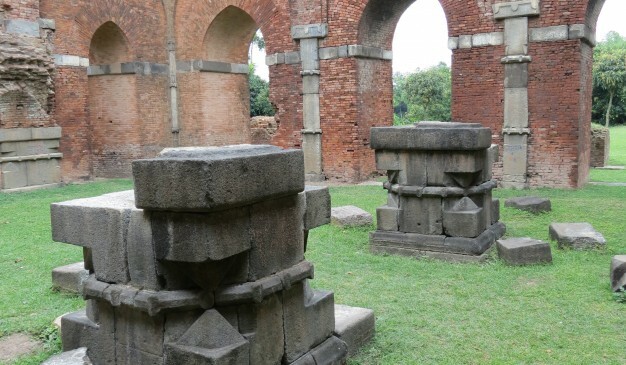 Local people believe, this is the grave of Kalu Khan, the master architect of Kantaji Temple. It is an oblong three-domed mosque with octagonal towers at the four corners. 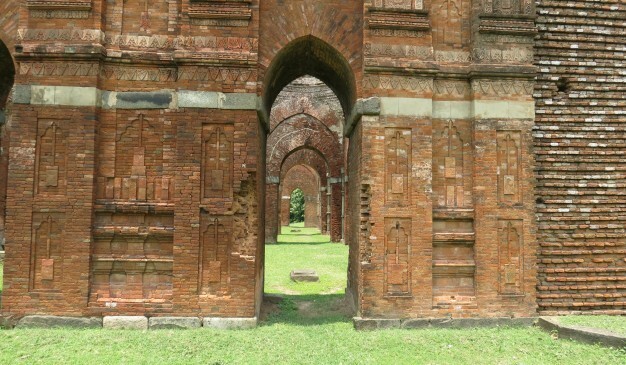 There are three arched entrances to enter the mosque. Among them, the central one is bigger than the flanking ones. These are equal in height and width. There is an arched window each on the south and north sides. Inside in the western wall there are three Mihrabs in line with the three entrances. The central Mihrab is bigger than the flanking ones which are of equal size. Three hemispherical domes cover the mosque, of which the central one is bigger than the side ones. Pendentives have been used in their phase of transition. The parapet and cornice are straight. 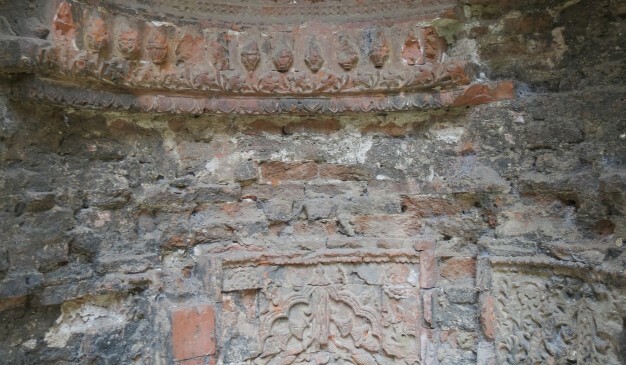 Terracotta plaques have been used in decoration of the mosque. At present there are about 104 terracotta plaques rectangular in shape, used in the surface decoration of the mosque walls. 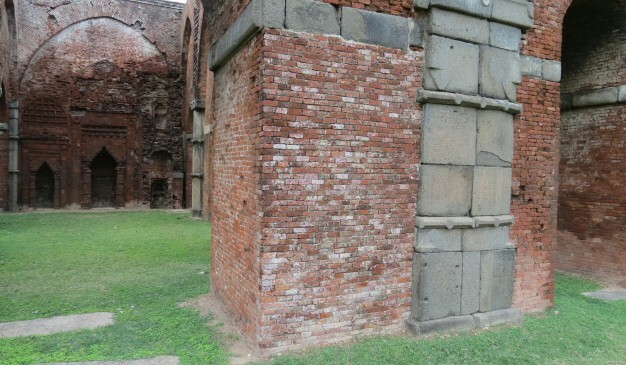 The platform of the mosque is enclosed by a low brick wall with only one access from the east. 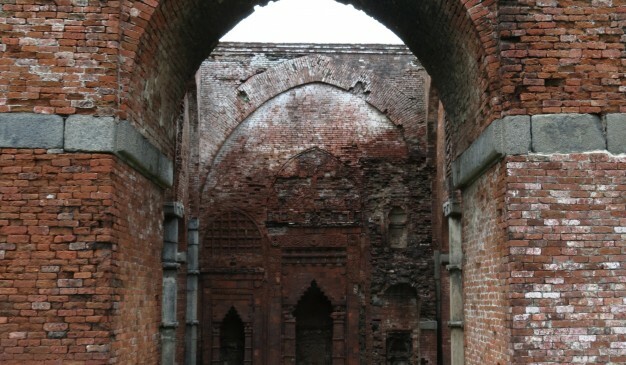 On either side of the mosque are to be seen a number of tombs each of found fixed over the central doorway of the mosque. Chandanpura Mosque is an attractive multiple domed mosque. 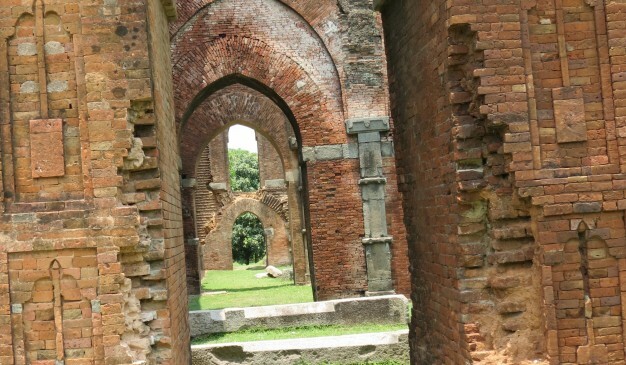 This is situated is just beside the Kaptai road, the old part of the Chittagong. If you are traveling the place from Chittagong, then you can take a CNG auto rickshaw, and just ask the auto to take you at "Chandanpura Mosque". The mosque is renovated at 1952. The colorful design of the mosque is really outclass. Recently due to pollution, the mosque is losing its beauty day by day. 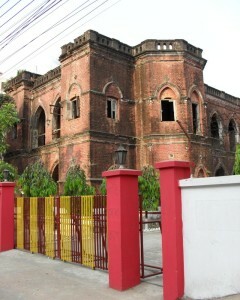 Just opposite of the mosque, there is fire station. This building was built during the British reign. This red building of the fire station is very eye catching and make people remember the history of infrastructure of then British Architecture. 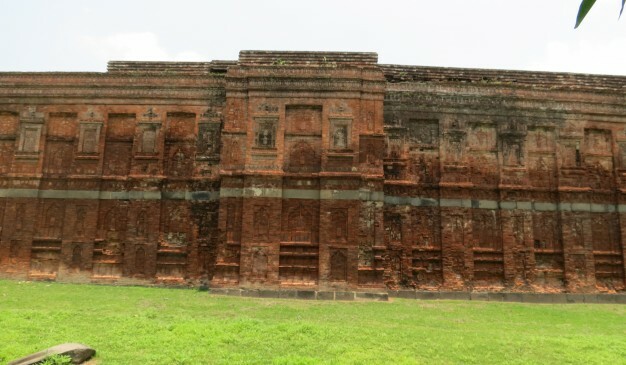 Korapur Mia Bari Mosque (কড়াপুর মিয়াবাড়ি মসজিদ) is an old mosque from the Barisal district (বরিশাল জেলা). 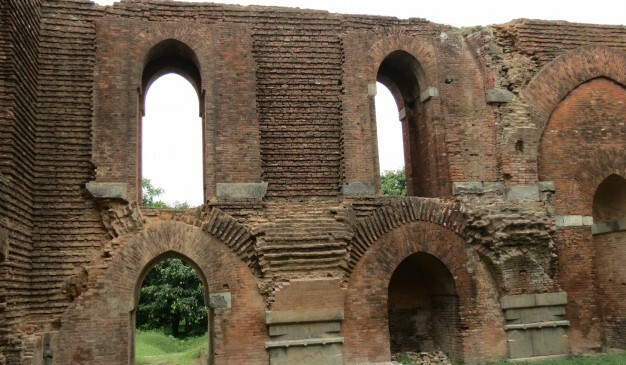 The mosque is located at the Mia Bari (মিয়া বাড়ি) of that area. 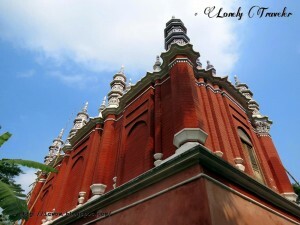 It is believed that the mosque was built during 18th century. They have painted the mosque recently, and also doing some sort of restoration now. And thus it lost its antiquity entirely. This mosque is built over a high plinth. Or, may be its better to call it a high basement instead of a plinth. Inside the basement it has several rooms at ground floor. These days it is being used as a resident for the student of nearby Madrasa (মাদ্রাসা). There is a wide stair available to reach at the mosque that is at the second floor. It is a rectangular shaped mosque having three small sized domes at the top where the middle one is slightly larger than the other twos. The mosque has total eight minarets with four at front and four at the back side walls. Apart from these, there are several small minarets available in between. All the minarets and the upper portion of the mosque is highly decorated. At the eastern side of the mosque it has a very large water pond. 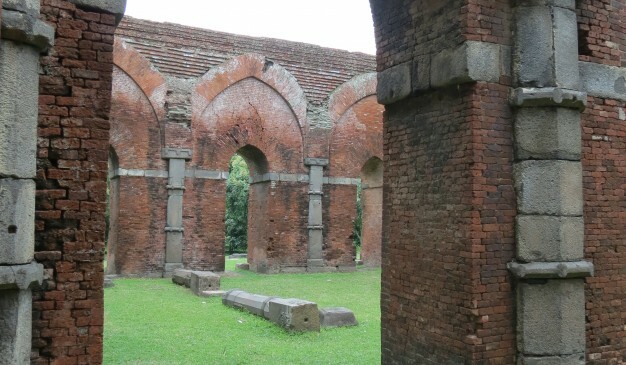 The photo of this iconic mosque used to be printed on the Ten Taka note of Bangladesh. Nowadays these notes are very rare and are available only at the banks or on in the collection of few people now a days. 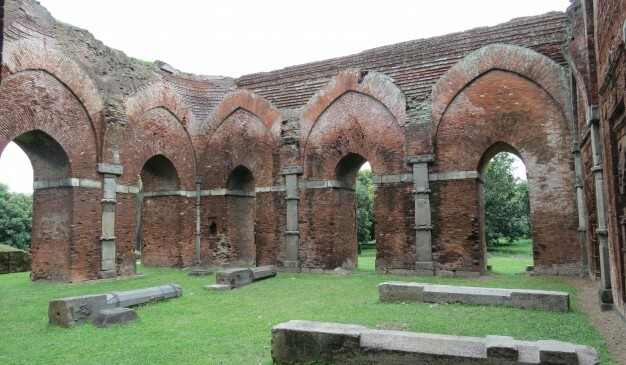 Atiya is a historical four century year old mosque located at the Delduar Thana of Tangail district. 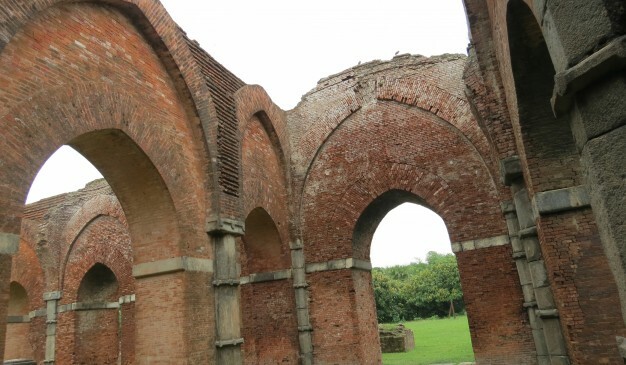 It was named by the village Atiya and the mosque is also known as Atiya Jame Masjid. 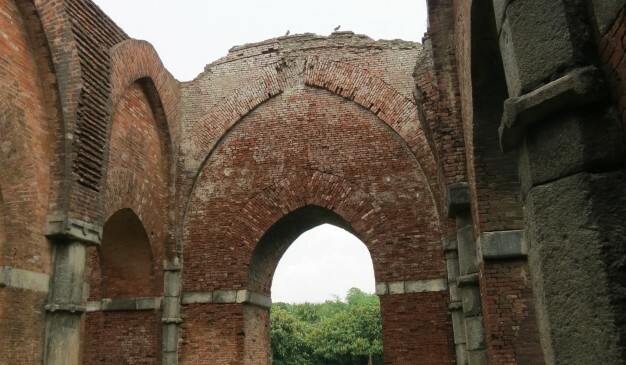 Atiya Jame Mashjid is approximately 6 kilometers from the Tangail town. A small river called Louhojong Nodi flows near the mosque which gives it a more aesthetic appeal. The mosque is around 18m by 12m, it has four spherical domes at the top, one is the larger, which is located at the west part of the mosque. 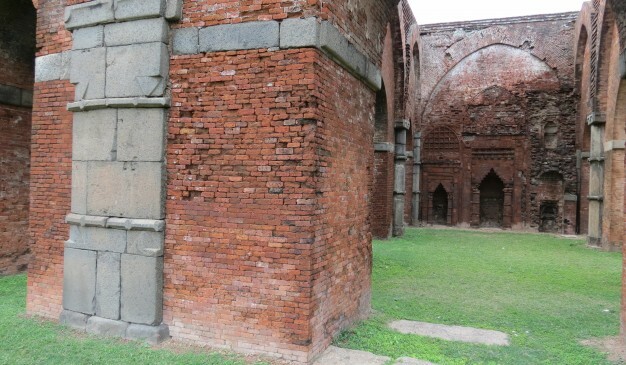 Other three are smaller sized and located at the east side of the mosque. All three domes are in a single row. Seems like the bigger one is for the Imam, and other three are for Musalli (regular people). 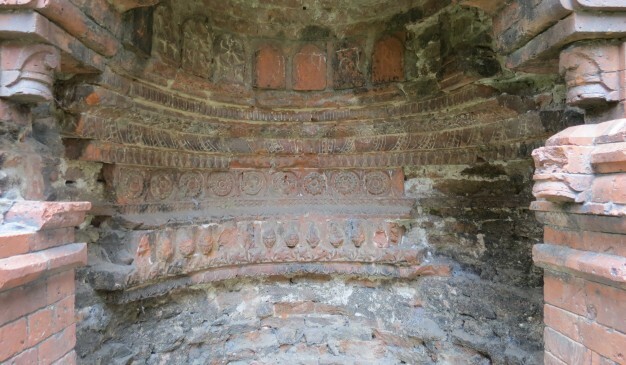 All the domes are decorated at the bottom part and having a small minaret like object at the top. The mosque has four pillars at the four corners and each of the pillars are stylish and decorated nicely. 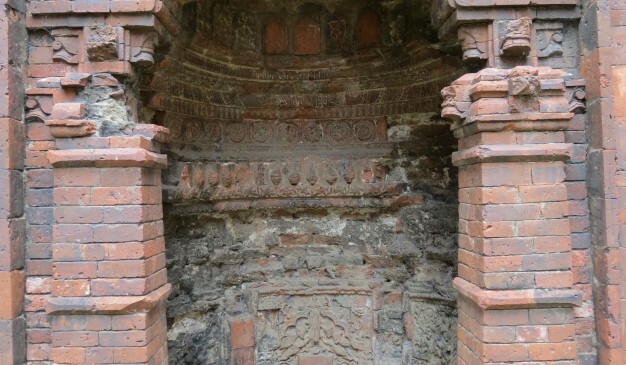 The mosque has lovely terracotta at the outer side of east and the north side wall. Those are very simple with just few small flowers inside the circles. The mosque has three entrance at the east side, and two entrance at the north and south side each. 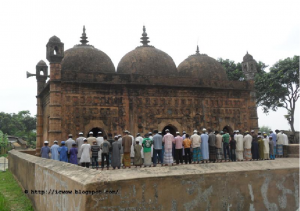 This mosque was built during 1610 by Muslim Jomidar Sayeed Khan Panni, son of Baizid Khan Panni. 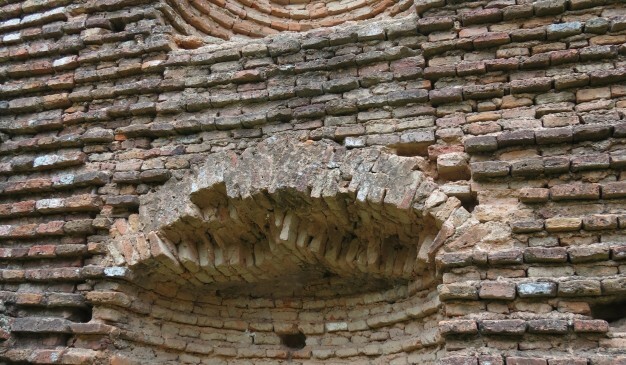 He also dug a large water tank at the western side of the mosque. Local says that the mosque was built for the honor of a saint Shah Baba Kashmiri. 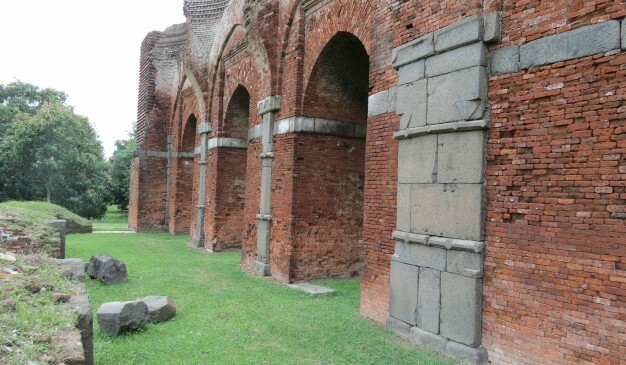 The mosque was damaged during the massive earthquake of 1800. A reconstruction of the mosque was made in 1837. 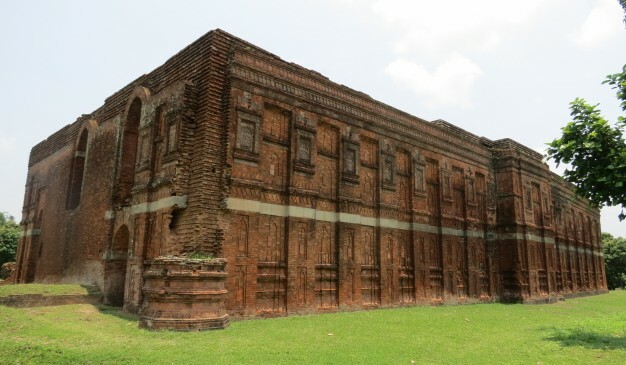 Also, during 1909 another reconstruction made by two Jamindar from Korotia and Delduar of Tangail jointly. Wazed Ali Khan Panni was from Korotia, and Abu Ahmed Guznavi Khan from Delduar.